1Travel technology has brought immense changes to tourism and air travel is no exception. Some argue that AI in travel technology represents a threatening competition to the human workforce as it is able to make processes automated, quicker and at much lower costs. In air travel there are three major categories in which AI affects the industry: robots, machine learning and ChatBots. 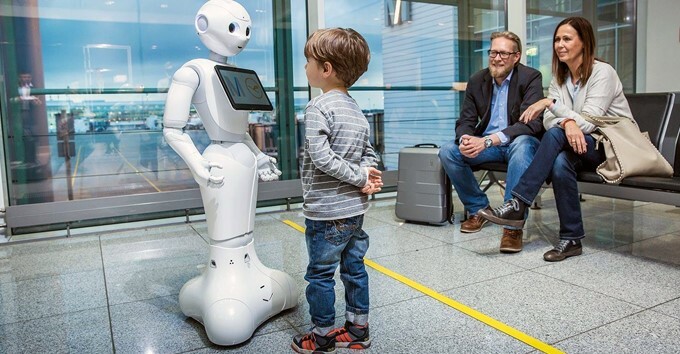 In mid-february 2018, Munich Airport became Germany's first airport to try out Josie Pepper - a humanoid robot equipped with artificial intelligence. The robotic helper welcomes travelers, speaks English and is well-equipped to answer questions about directions to a duty-free shop or a departure gate, flight operations, restaurants and shops. Robots can also be found at UK airports. Glasgow airport is testing a robot called Gladys to provide passenger information. Robots are also reported to have been used at Indianapolis Airport in the US, Edmonton Airport in Canada and at the Roma Fiumicino airport in Italy. Machine learning is the AI’s feature in travel technology that airports adopt in developing facial recognition. It is used to verify customer’s identity by matching the faces to the passport photo. In 2017 Delta and U.S. Customs and Border Protection launched a test project at Hartsfield-Jackson Atlanta International Airport that allowed customers to use facial recognition machines. They simply need to approach the camera as their picture is taken, receive their confirmation receipt and board the flight. Travel technology adopting machine learning principles has been introduced also at the airport of Dubai, where they started using smart gates to automatically detect travelers based on facial and retinal recognition and cutting check-in time to as little as 20 seconds. Passengers must first register their biometrics (a one-time process), but once the recognition is made, the gate opens automatically. AI travel technology has been adopted also by KLM, who recently launched BlueBot (BB) – an artificial intelligence-powered tool that enables customers to search for and book flights through Facebook Messenger. Customers can chat with BB ‘virtual agents’, who can answer any questions and help them book their flights, however human customer service agents are also on hand to help if needed. Virtual assistants might be helpful also at finding lower flight prices, but there are also other ways you can find extremely low prices. Check out for error fares! The use of IoT initiatives in travel technology has been adopted for resolving the issue of lost luggage, which is causing a lot of stress to passengers as well as a lot of costs to the air travel industry. IATA has therefore adopted a resolution which requires airlines and airports to adopt IoT tools to reduce baggage mishandling. Thanks to sensor-based baggage solutions, you’ll receive a push notification when your bag is loaded, when it arrives and where it is being transferred to. Lufthansa’s passengers can already use this latest travel technology to track their baggage via a link found on their mobile boarding pass in the Lufthansa app. Another example of the adoption of internet of things can be experienced at the London City Airport, which allows security checkpoints to communicate with each other, and then to send a notification to a traveler’s mobile device with estimated wait times and delays. Internet technology solutions are being introduced also at Gatwick airport. Airline companies use virtual reality to demonstrate an aircraft cabin and to demonstrate their Business Lounges ... Qantas Airways is the world’s first airline to introduce virtual reality headsets in 2015 on their Airbus A380 flights in the first-class cabin. The airline has since expanded its usage of virtual reality in their travel technology by creating a mobile application available across multiple platforms for travelers to experience Australian destinations on and off an aircraft. Lufthansa has a dedicated mobile application on the iOS or Android platforms with unique 360-degree content that introduces different cabin classes, airplanes and travel destinations served by the Lufthansa Group. Singapore Airlines also created a website with embedded virtual reality tours of its cabins in 2016. Wearable devices have also been introduced in the travel technologies. A great example is provided by Air New Zealand which is testing Google Pixel Buds, which enables their crew members live translation of 40 languages via the Google Pixel smartphone. This improves their customer experience on board of the aircraft and make the journey even more pleasant. The experience of travelling by plane is far less pleasant if there are delays. Read the following 3 tips how to protect yourself against the negative consequences of flight delays. Travel technology aims to improve our overall mobility, on the ground and in the air. Brussels Airport has given the go-ahead for the introduction a self-driving electric buses on the airport campus. After the summer of 2019, tests without passengers will begin at the test site in Utrecht, while the shuttle bus should arrive at the Brussels Airport at the beginning of 2020 for further tests. Busses are a great way to travel, however to reach the airport, GoOpti is far more the best choice. To reach the airport GoOpti is your best partner. Did you know that with a few tricks you can considerable lower your price? Ready take off? Book your airport transfer!